Table Salt or Kosher Salt? Every cell in the human body is dependent on sodium for survival. It serves many functions in the body, including helping to carry nutrients into the cells. It also helps to keep minerals and calcium soluble in our blood, regulate muscle contractions, and plays a role in nerve stimulation. It is also required to produce hydrochloric acid in the stomach, which is an important component of digestion. All salts, kosher salt included, helps the body regulate the electrolyte balance in and surrounding the body’s cells. It also serves to preserve the body’s blood cells and blood vessels. Low salt intake can lead to muscle spasms, irregular heart beat, increase risk of heart attack, and even sudden death. Kosher salt, as opposed to table salt, has no additives. Table salt, or iodized salt, often contains additives. Some common additives in common table salt include potassium iodide, sodium iodide, and sodium iodate. Also, sodium silicoaluminate or sodium ferrocyanide is commonly added to table salt as an anti-caking agent and occasionally added to kosher salt. Kosher salt, which does not contain the iodine additives that common table salt contains, tastes lighter, milder and cleaner than table salt. Kosher salt tends to be less salty overall than table salt. Kosher salt is comprised of larger and coarser grains compared to table salt. Due to the larger grain size, kosher salt is easier to pinch and measure with your fingers, which is why it is a favorite of many chefs. However, because different brands of kosher salt come in many different sizes of grains, it is often hard to pinpoint the exact amount, such as a teaspoon, for a recipe. But with practice and trial and error, you will begin to get a feel for the correct amount if you use one brand consistently. Kosher salt is ideal for curing meat due to its large surface area, which allows it to absorb more moisture than other salts. 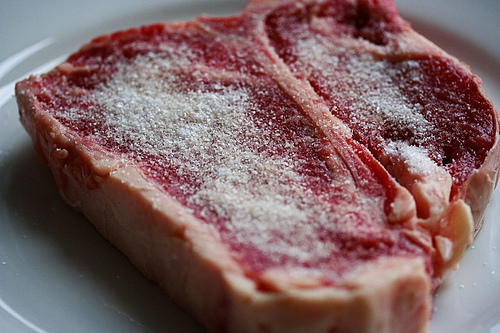 Curing meats gives them a longer “shelf life.” Using a kosher salt layer before cooking meat breaks down the proteins improving the texture of the meat. Kosher salt is wonderful for bringing out the natural flavor in many foods and dishes. Without salt, the overall taste of many foods would be quite bland. Kosher salt will actually increase the temperature of the water when boiling foods, such as potatoes, pasta or vegetables. This, in turn, will shorten the amount of time that the food needs to cook. This can come in handy when you are in a hurry to put dinner on the table in the evening.